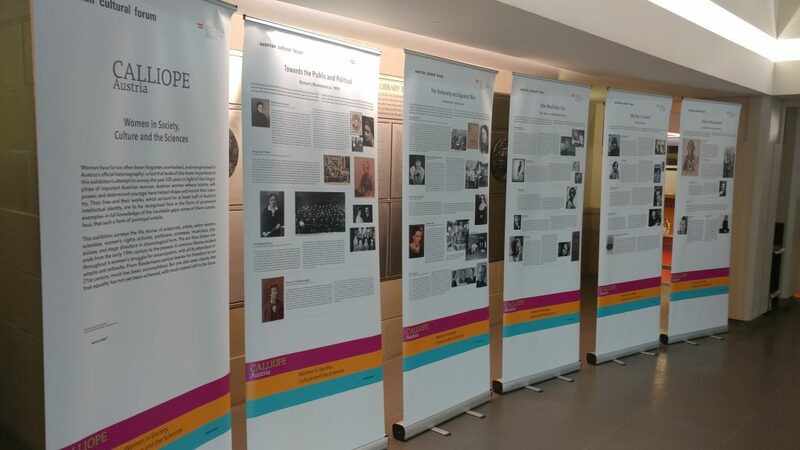 Calliope Exhibit from Austria – Women in Society, Culture and the Sciences. Meet with the Deputy General Consul, Austria. This travelling exhibit, created by the Austrian Federal Ministry for Europe, Integration and Foreign Affairs (BMEIA) and organized by McMaster’s Office of International Affairs, showcases an impressive collection of outstanding Austrian women, from the 18th century through to the present day, who have left their mark on Austria and helped shape history. The exhibit, with its portraits and biographies, acts as a reminder of how influential Austrian women, including the likes of Bertha von Suttner, Lise Meitner, Elfriede Jelinek and Hedy Lamarr, each made a lasting contribution to the empowerment of women in Austria and worldwide. This exhibit has been in Mills and Thode Libraries for the last two weeks. On Friday, September 14 it will be in the West Room in the University Club. The Deputy General Consul from Austria, Mr. Faustenhammer will also be in attendance so do stop by and say hello.